Well as they say all good things must come to an end. This holiday was always just planned as a quick trip to get away from work for a while, so I guess we need to get back to work to start saving for the next one. Well I guess we had better start packing – these suitcases are not going to look after themselves. Opted to skip breakfast this morning – instead we feasted on Milo Nuggets and various other unhealthy snacks (My theory is that if we eat them now it is less to pack for later). Our flight this evening is not till around 10pm so we have a bit of time to kill around town. We check out of the hotel and ask them to stash our luggage for us. First up we need to get a last minute gift for a friend back home so head down to the Kuala Lumpur Craft Complex; If you haven’t been before this is a really funky place to go check out – there is a fabulous gift shop selling amazing unique Malaysian Arts and Crafts. Out the back is a fabulous Artists Village where various local artists are set up in little houses and demonstrate their craft. If you have the time you can actually sit and paint your own Batik Silk Fabric painting – and if we had time this is definitely what we would do. The lovely ladies in the Batik area are only too happy to help teach you the Batik Art process. If you have children I highly recommend this activity as you can keep the little ones (and not so little ones) occupied for hours on end for very little – usually only about RM30 per piece. The Craft Complex is located just next door to the Royal Chulan Hotel – a short walk down from the Pavilion Shopping Centre. It is also a stop on the KL Hop-on-Hop-Off tourist bus. After stocking up on gifts we walked down to the Suria KLCC, taking the shortcut through the KL City Park. From the Craft Complex it is about a 900meter walk to the KL Conference Centre. The City Centre Park is a really lovely place to spend some time and a way of escaping from the harsh humid KL heat. 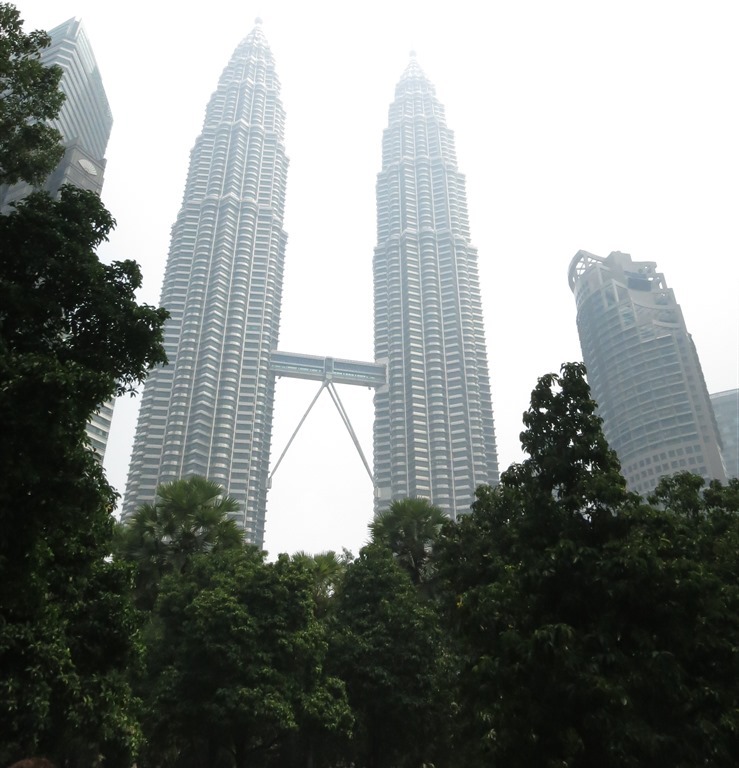 Bit of a hazy day today but usually you will get an amazing view of the Petronas Twin Towers (especially by night). The park has plenty of trees and cool places to sit. For the energetic (crazy) there is also a rubberised running track around the park – you will often see people out jogging of an afternoon/evening. For Kids there is a lovely kids swimming area and playground. 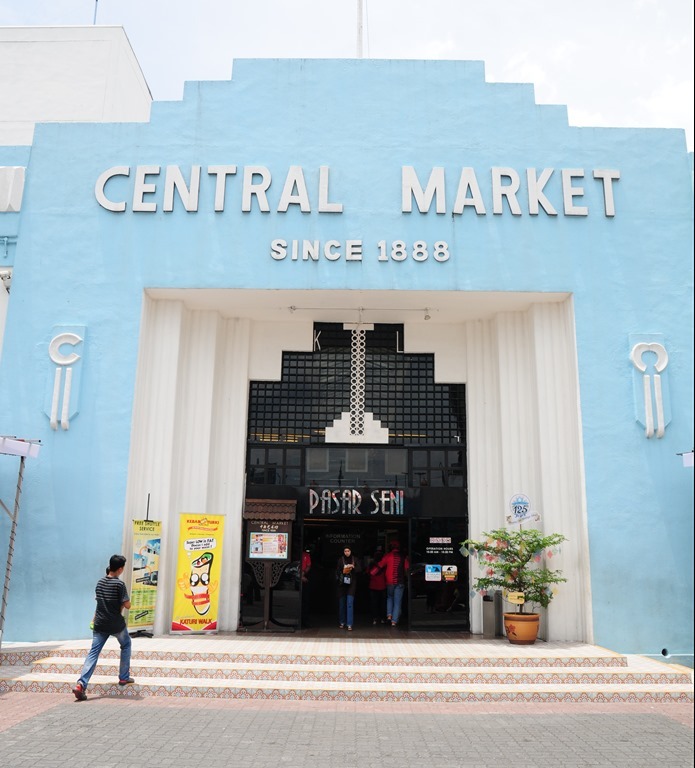 The Central Market is a fantastic place filled with amazing Malaysian Art and Craft as well as antique displays. There are at least 100 retailers in these spaces selling well – everything Malaysian. There are also traders selling arts and crafts from various other countries that have been traditional trading partners with Malaysia for many years including Indian, and middle eastern. Dan always stops at this lovely Indian seller for a Henna Tattoo – they also sell some lovely scarves and saris (which she can conveniently buy whilst having her henna tattoo). After Central Market we headed back to the hotel to grab our bags and hop in a taxi to the airport. The hotel was able to arrange a car for us for about RM150 – it may have been cheaper in a taxi but at least there was plenty of room for our bags and it was easy! We had plenty of time to spare at the airport and decided to try and find a place to stop and have a shower to refresh. The handy thing about the new KLIA2 airport as I mentioned previously is the Gateway@KLIA2 shopping complex. There are a number of Lounges and Hotels that you can get access to for a smallish fee. 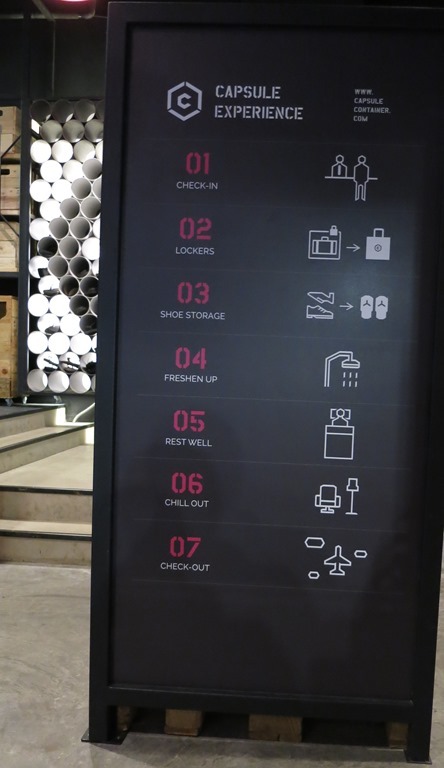 We decided to stop at the really funky Capsule by Container Hotel on level 1 of the Gateway complex. 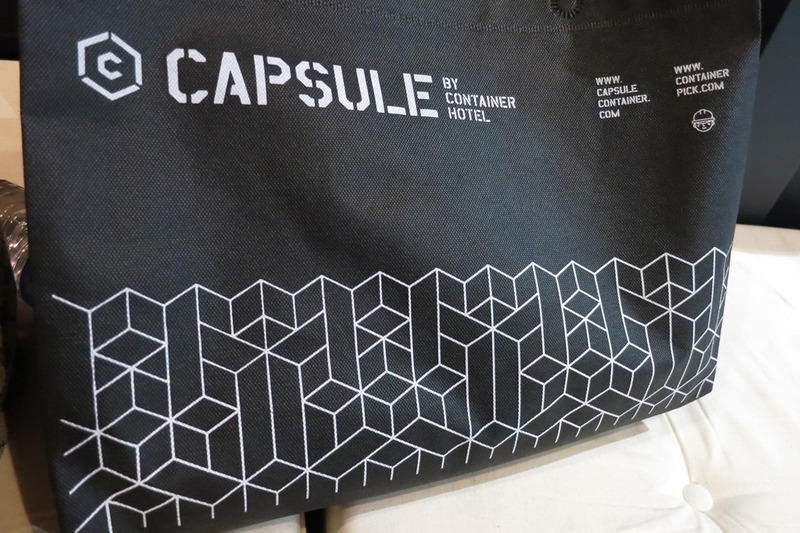 This place is along a similar line to the capsule hotels you might have seen in Japan. It is basically a whole bunch of shipping containers that have been converted into small rooms (well a bed) that you can hire out for a period of time. Really handy if you have a long transfer time between flights and just want somewhere to store your stuff and get a quick nap. Also handy if you just want a shower. So you can book a room for 3 Hours (RM45) / 6 Hours (RM70) / or 12 Hours (RM90) which includes complimentary Locker use, shoe storage (you can change into some funky thongs), Shower (including toiletries), then a bed to rest in. Each of the bedroom container pods include a light and also a power point so you can recharge your phone/tablet etc. There is also a funky sitting area. If like us you just want to have a shower then for only RM15 you can get an amenities bag (which you can keep) including a towel. 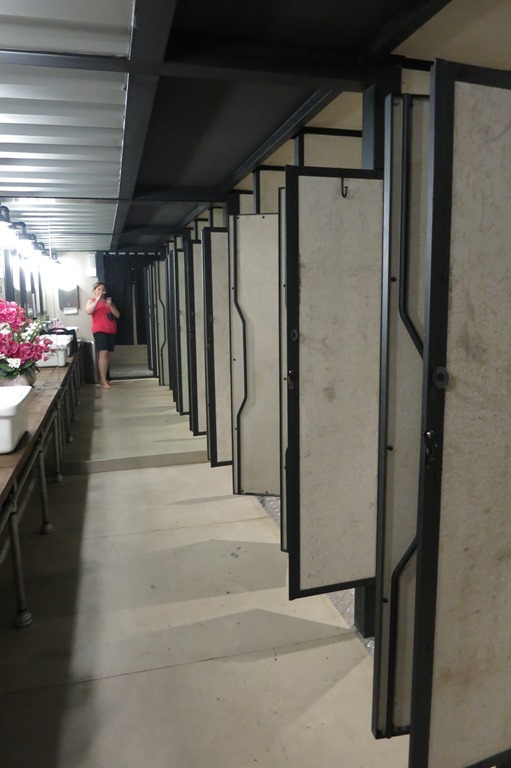 The shower block/container is quite good with plenty of showers and there are also toilets and dressing areas. 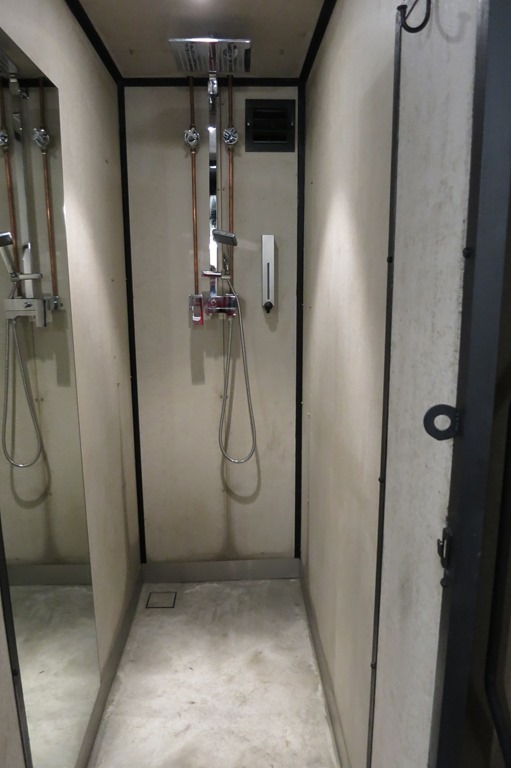 I will give them their due – the showers were really nice, strong water pressure and really hot water. Nice rainfall shower heads as well – this is the perfect place to have a shower to freshen up after a long flight, or to get ready for your next flight. After we had showered and got changed for our flight home we headed to the main terminal building…. ….via a few more shops on the way so that Dan could buy MORE baby clothes from the Fashion Outlet – 3 BabyGap Jumpsuits for RM15…that is it intervention no more baby clothes. 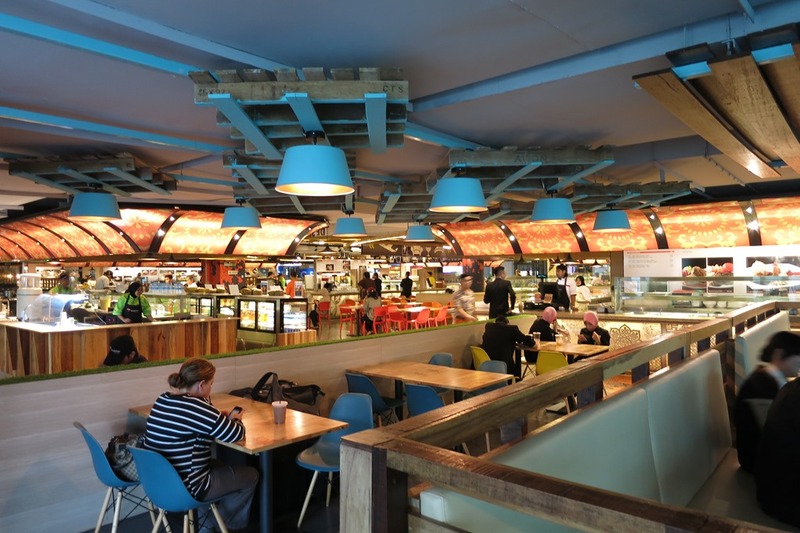 While you are at the Gateway complex pop up to the Level2M Food area, you will find all your usual boring international chains but around the corner is Quizinn by Rasa Food Court. 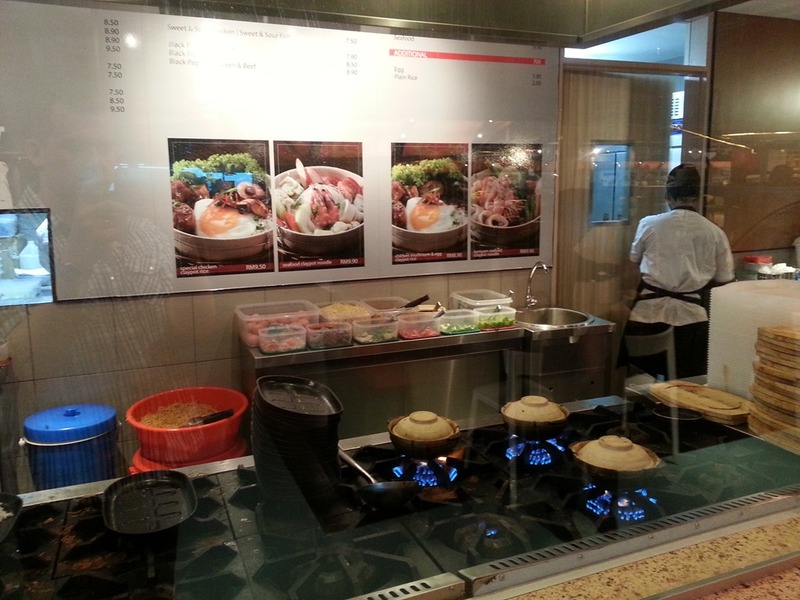 It is along the same line as the Food Republic you will have seen in Pavilion Mall. Lots of vendors selling a wide variety of meals at amazing prices. You know it is a good place to eat when most of the patrons are the airport staff. 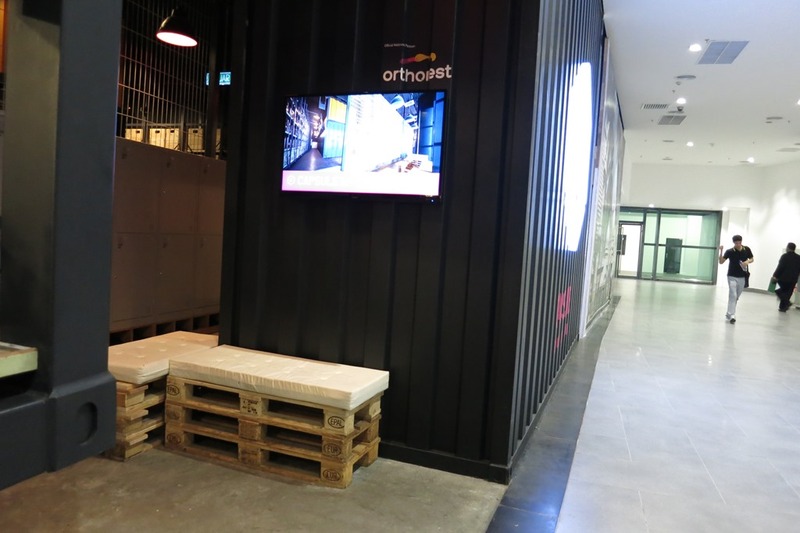 There is plenty of seating available and from the looks of it they are also about to put in a spot on the far wall where you can recharge your mobile phone. I don’t think it had been open too long as it all looked very new and the staff at some of the stalls were still learning the cash registers. Yum! I feel for the poor person who has to clean these pots, the claypots are sitting on the flames and the rice is cooked inside the pot, then all the goodies are added. So that when you are eating it some of the rice has crisped up onto the side of the bowl. Seriously tasty. 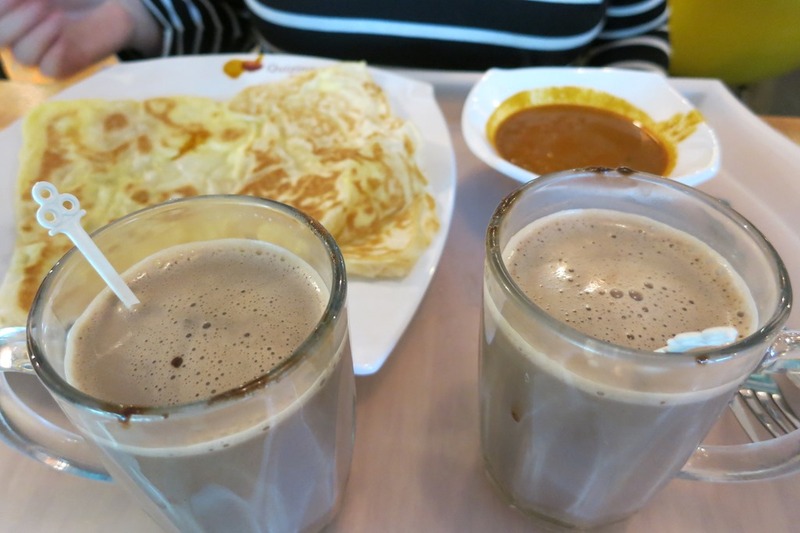 Dan went for the Roti Telur and the Roti Cheese – RM 7.95 – plus we got a couple of Iced Milo drinks to go with it. All up for the 2 meals and drinks we paid about RM30. 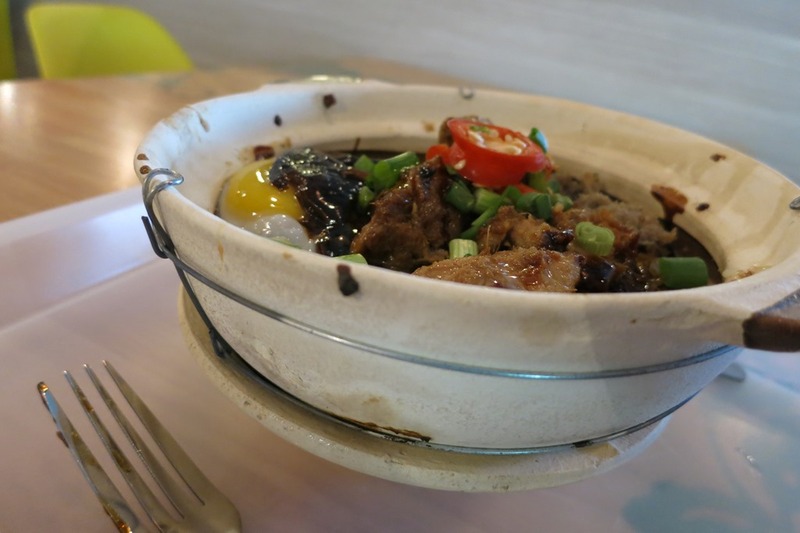 So that is it – last meal in Kuala Lumpur – time to go check in to the flight. Stopping of course for one last round of essential gifts – sticky – sell amazing Hard Candy lollies that are usually made on site – they make perfect gifts for people (and taste pretty darn good as well). We picked up a few jars (4) for gifts – RM51. Quickly repacked the bags to head to the main terminal building – given my bag was so full I decided to have it plastic wrapped – not because I feared any security threat just purely to protect the zips from busting. Wife was upset when it came to the weigh in – mine was 28.8kgs and hers was 25kgs – she was so sad that there was 6.2kgs of shopping potential wasted. Made it through customs and security pretty quickly (I would say it was only about 15minutes max) and headed out to the satellite terminal building – across the huge walkway. As the airport is still being finished all of the duty free shops haven’t been opened yet, however they say in the next couple of months they will be open. I stopped and bought a bottle of Scotch Single Malt at the duty free liquor store near our gate – RM198. As a note/trap – once you head out to your gate you actually go through another security checkpoint so you can’t take any liquids etc. through – any duty free will be delivered to the gate before departure. That means you will also need to finish and drinks etc. On “the other side” there are a few retailers so you will be able to get a drink and a snack before your flight – but my advice is to stay on the terminal side as long as you can if you want to sit and have a few drinks before departure. We proceeded to the gate and had to laugh at the customs check – complete with Australian Immigration Official (obviously checking for illegal immigrants) – and just to make it look like they were not targeting specific people they made sure to question all the Aussies “how long you been out?, what was the purpose of your travel….” – humorous – and what a lovely WELCOME TO AUSTRALIA to any first time tourists. The flight was actually pretty good – managed to get a few hours of sleep and the 8 hours actually seemed to just fly (pardon the pun) by. It is always the way – the flight there seems to take double time and the flight home no time at all. 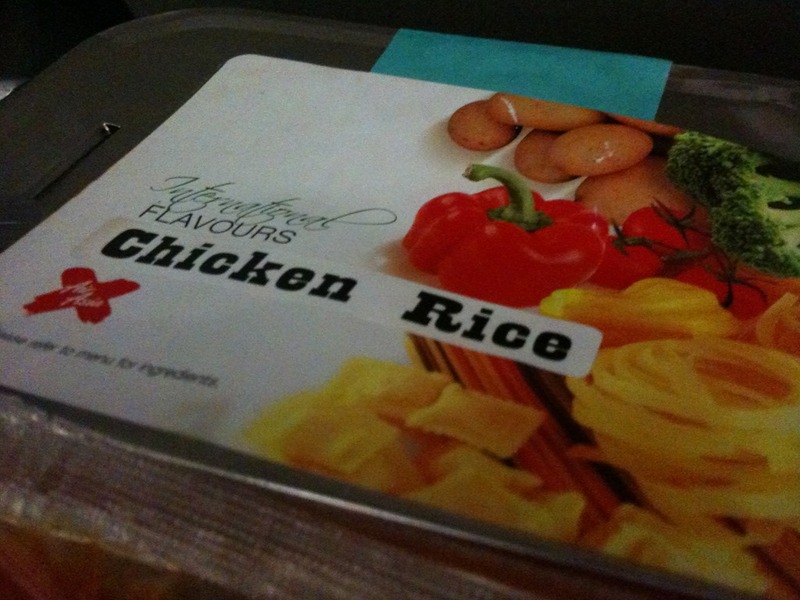 The meals were actually pretty tasty – I have found on most AirAsia flights the meals are usually pretty good. 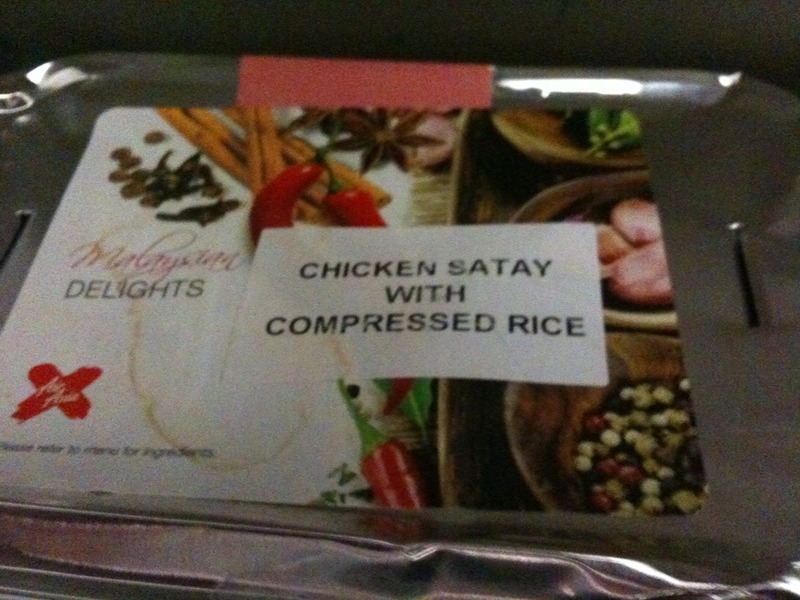 The Chicken Rice was lovely and had a nice bit of spice about it. As another hint – make sure you pre-order a comfort kit with AirAsia. They are cheap but include a Blanket, Neck Pillow, Eye Mask. You can keep them and take them with you. We got ours first trip in 2008 and have used it on every international flight since – so figured it was time to upgrade and get a new kit. It is funny the kind of dirty looks you get on a Virgin flight when you whip out your own AirAsia blanket to keep warm! Landed safe and sound, pretty much on schedule – picked up that last minute duty free on our way to Immigration. Oh how I love landing back in Australia – the total inefficiency in which Australian travellers returning home have to endure, as usual it took us about 30 minutes to get through passport control, then about 30 minutes to get our bags – and joy oh joy my bag got damaged – considering it passed through KL and Indonesian hands without incident I have a thought when the damage occurred – then it was about 30 minutes to get through Customs. Called the guys at EzyParking Gold Coast and they had a van there within minutes to pick us up. Our car was waiting for us back at their office and had been nicely cleaned – for only an extra $30 they will wash your car for you so that you get it back nice and clean – well worth it. Well that’s it for another trip – hope you have enjoyed riding along with us on this journey. If you haven’t already – please follow my blog as I will be adding further information and reports up progressively. Thanks for checking out JustMyTravelBlog – Just My Travel Blog is my attempt at bringing you just an everyday average travel blog. We are not professional travellers or writers (as you can no doubt tell from the quality of the writing), but we aim to bring you a realistic picture of the places we visit – please feel free to leave a comment below and let me know what you thought of the blog. I hope it is of assistance for you in planning your next holiday. Thank you for writing a fantastic report …it is full of great usable info..you guys had a wonderful trip by the sound of it..we have often wondered about Amed area now you have helped us make. Positive decision…keep up the great writing.